The first week of school is over, we can all stop trying to impress everyone now. 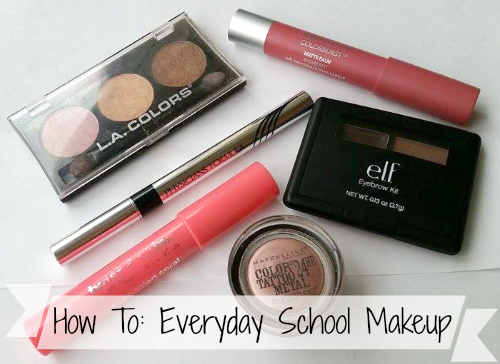 Let's get down to the nitty gritty and the basics of what your everyday makeup is going to look like while you run to classes. Personally, I wore minimal makeup to school after the first week because doing a full face of makeup takes too long - and I like to sleep. So here are the staples I used everyday to get ready for school. A good eyebrow gel and powder. 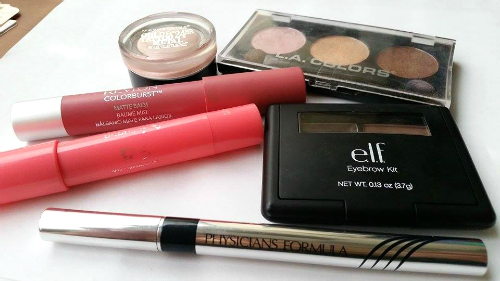 I personally love the elf Eyebrow kit in medium, you know I rave about it all the time and its my go-to. Its also super inexpensive ($3!) and good for that student budget. Cheap and neutral eyeshadows. I've got two options here, one is the L.A. Colors palette in Orchid. I think it's perfect because the pigmentation is up to par, lasting ability is pretty good, and it was $1 at the dollar store. I can toss it in my everyday makeup bag and not worry about it if it breaks or the plastic itself gets cracked. The second option is a little pricier at $7 but it's the Maybelline Color Tattoo Cream eyeshadows in Inked in Pink. I also recommend Bad to the Bronze if you can ever find it on sale. Both are an awesome neutral one shadow color that you can just spread all over the lid and it will be good for the day. Liquid liner - my go-to for everyday since the beginning of high school. Pens are super easy to use and even easier to get that perfect flick for a cat eye. Out of all the eyeliners I've used, I love the Physicians Formula Eye Booster in Ultra Black. Super simple to get an awesome wing and it stays all day! For lips I've left 2 options one kind of glossy and another definitely matte. One is a super cute corally pink by Jordana in the color candied coral. This one is a moisturizing lip balm, and has a good lasting power. You can find these at the local drugstore (I got mine at Walgreens) for about $2-$3. The second is a Revlon Colorburst matte balm in color 205 Elusive. Its a pretty basic matte pink that is perfect for everyday wear. It was a bit more expensive at $10 but I find it well worth it. I personally don't love glosses for school because I felt like I had to keep reapplying it all day. Whereas both of these I probably have to reapply after I eat and that's pretty much it. What do you wear on an everyday basis when your running to school/work etc.? Thanks for sharing. I looking for neutral makeup for school too, and I found your blog!.